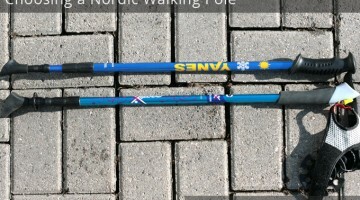 There is no formal, legal definition of what exact characteristics constitute a Nordic walking pole, or stick. Established brands of Nordic walking poles in Europe include Exel (Finland), Gabel (Italy), Kompardell (Austria), Leki (Germany), and Swix (Norway). In Canada, an established brand is Nordixx. There are two points of contention around Nordic walking poles: the question of wrist straps, and the actual construction of the poles themselves. Nordic walking associations around the world seem to agree that technically if a pole doesn’t have straps and doesn’t have angled rubber feet, then while it may be a fine pole for some kind of walking, and even though the maker of it may say it’s for Nordic walking, that it’s not technically, actually a Nordic walking pole. 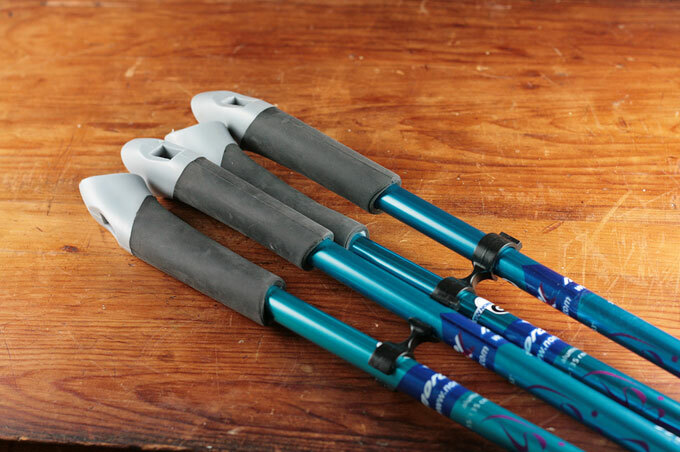 Exerstrider poles, which are strapless poles made in the US, would therefore not be strictly classed as Nordic walking poles, though they are considered very good for other forms of fitness walking. Urban Poling poles made in Canada, also being strapless, would seem to fall into the category of being fitness walking poles like Exerstriders. Some poles are half way between, in that they have wrist straps but ones that seem more designed to prevent you dropping the poles rather than being necessarily a means of pushing the poles as the straps are on most Nordic poles. In any event, the strap vs strapless question seems to be a minor debate compared to the debate of fixed-length, adjustable-length pole vs one piece solid pole. I have to say that I found that the adjustable people come across as the more flexible (no pun intended) people in life, who seem inclined to say “whatever works best for you”, while some in the fixed-length camp can come across as rigid and ideological, and very unhappy that the rest of the world isn’t compelled to make the same morally superior pole choice as they did. And women won’t be surprised that all the egos involved here belong to men. This is just to say — weigh the pros and cons of both types of poles (as you’ll see below) in light of what you think will work best for you and your life, and don’t be bullied into deciding otherwise. Marko Kantaneva, one of the founders of the sport, apparently promotes both fixed-length and adjustable poles equally. 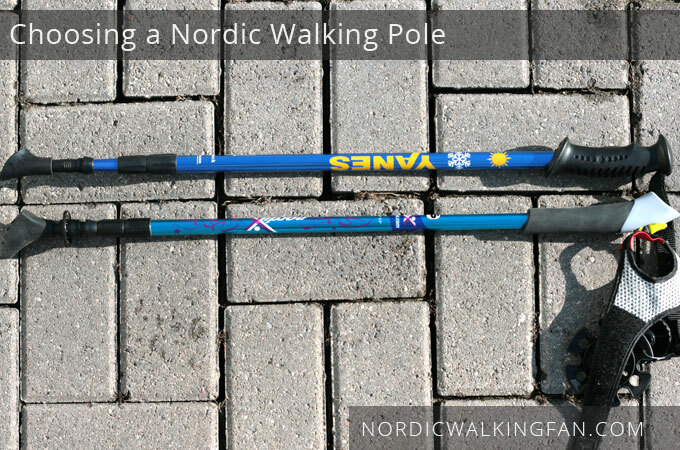 There are six factors to consider when pondering which type of Nordic walking poles might be right for you. For items such as the rubber feet, snow baskets, etc see: Nordic Walking Accessories . Some makers of Nordic walking poles do call their strapless poles Nordic walking poles, even though others would say they are not. Greater minds than ours can decide the matter; I’ve simply written about the pros and cons as I understand them so far which you can read here: straps vs strapless walking poles. 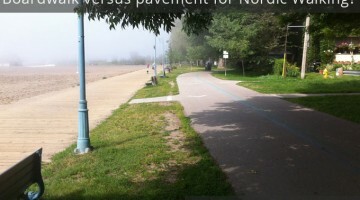 Some people feel that straps which are not much more than wrist loops aren’t good for developing the push technique that real Nordic walking requires. Fixed-length poles are just that: poles which are a set length, and are all one piece of pole. These poles are generally sold in pre-made lengths between 100 and 130 cm, with differing lengths at 5 cm increments between those two numbers. That being said, some fixed-length models do cheat a bit, having a small part of them which will go up or down a bit to help get a more exact fit for the user, allowing (usually) a +/-5cm adjustability range. Without that, some say, the risk is that you could find the a pole just a bit too long or short for you. Sometimes these are called “extending poles” because they extend a bit. Fans of fixed-length poles say that they are generally lighter in weight than adjustable poles, and that they like the feel of the poles as they swing. They also feel that the poles are sturdier than adjustable poles: that they trust them more to support them should they want to go leaping and bounding about. They also feel that the fixed-length poles vibrate less when they strike the ground than adjustable poles do. One downside is that should you be the hospitable type, it’s harder to stock up on spare fixed-length poles for visiting guests that you might want to drag out on a walk with you, unless you purchase and keep to hand many different sizes. Adjustable poles have sections that you pull out to make the pole longer, or push in to make the pole shorter. Generally, you then turn the poles to lock the extensions into place securely and safely. Such poles can have two pieces, or three. (The three-piece ones are often referred to as “telescopic” or “traveller” models.) The three piece models will collapse down into a shorter rod, easier for packing into a backpack or suitcase, and travelling. You can easily adjust an adjustable pole to the exact right length for you. The adjustments can “slide down” over time, resulting in one pole being shorter than the other at the end of an intense walk, say, but that’s almost always the result of not having tightened the pole’s locking mechanism enough. There’s a possibility that less well- made models could vibrate more in use than fixed-length poles but with modern well constructed ones that risk should be very minimal. There were some adjustable ones made that were of poor quality, but then there are also some fixed length ones just as poorly made. That being said, fixed poles probably may have a bit less vibration, adjustable people will admit, but they go on to say that it probably won’t be noticeable to most people anyway. Some say the most important factor is not adjustable or fixed but rather the percentage of carbon — the more carbon the less vibration. Adjustable allows for irregularities between different sides of your body, or restricted shoulder movement on one side. Adjustable poles are also easier to lend to a guest for occasional use, and easier to pass onto a friend or another family member as you upgrade poles. For fixed-length poles, there is one more step: you take the number you got, and then round down or up to the nearest even 5 cm increment. (If you got 112, round down to 110; if you got 114, round up to 115.) That gives you the length of fixed-length pole to buy. Here is a video covering how to calculate the length of fixed-length poles for you. It’s made by the Exel people but the principles apply to all poles. When the pole is the right length, then when you are holding the pole, with the pole angled back so that the tip of the pole is by your foot, then your arm should be bent at 90 degrees plus a bit more downwards — that is, about 100 degrees down. All Nordic poles are generally made of light weight metal. The metals used are generally either aluminum or carbon. Carbon is considered the best material, and generally the higher the percentage of carbon in the poles, the more expensive they are. 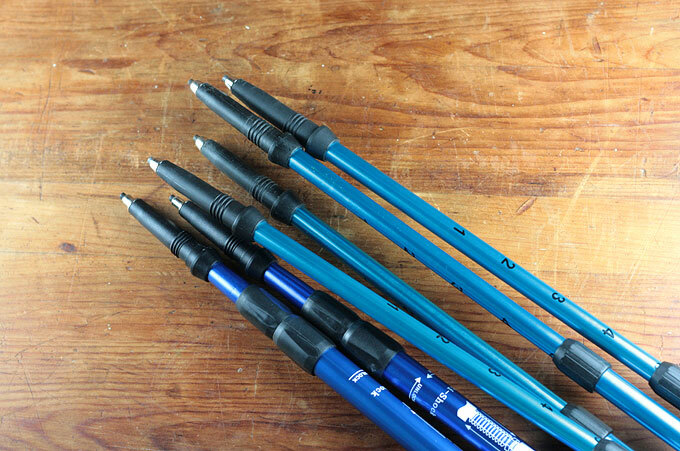 Good quality carbon poles are made from cross-linked carbon fibre. Good quality aluminum poles are made from 7075 aluminum alloy, which can be as hard as many steels while still being light weight. Carbon is lighter than aluminum, stiffer and vibrates less. Aluminum is more flexible, making it better for running and bounding because it’s less likely to break. Some poles may be composite carbon/fiberglass or composite 6061 / 7075 aluminum or composite carbon / aluminum. A beginner just trying Nordic walking on for size may not need to go to the expense of carbon poles just yet. They may be better to start off with good quality aluminum and then if they do become a long-term practitioner of the sport, the aluminum ones can be passed to a friend just starting out in the sport. 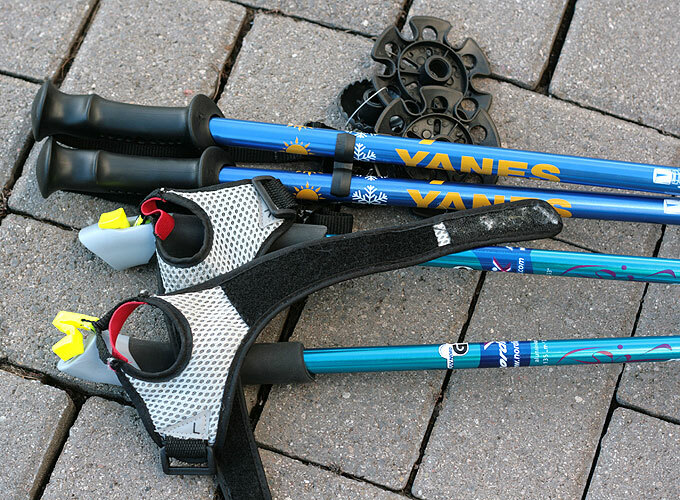 Some manufacturers (such as Leki) offer a guarantee against pole breakage. 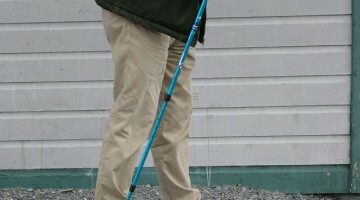 The handles on Nordic walking poles may be made of plastic, or foam, or cork, or any combination thereof. They usually can be replaced when they are worn out. Plastic and foam last longer than cork, but cork is absorbent, and offers a non-slip grip, especially in hot sweaty weather. Handle types don’t seem to excite the same sort of passion as pole types do. Most professionals will just say that the handles are a personal preference, but to remember that in theory you’re not supposed to be having a death grip at all times on the handles anyway. You don’t usually get a lot of choice about the tips that come with your poles. Though with some manufacturers, such as Exel and Leki, you can later buy more expensive tips as an upgrade. Tips are usually plastic with a carbide tungsten end, which may be blunt or pointed. Some people say, if you are only going to have one set of poles, make it an adjustable set, because then you can adjust the length and use the poles for all kinds of exercise walking other than Nordic. Others say as you get more experience, and as you start running, jumping and leaping about with your poles, you will want rock-solid sturdy one-piece poles. Nordic walking is a very friendly sport in which people generally don’t take themselves too seriously (if only because they can’t — remember the dork factor), but the topic of fixed vs adjustable pole type is one about which people will get quite arrogant and pushy so just ignore that and go with what seems best for you right now at this stage of life. Remember, there’s such as thing as “hand-me downs” — you can always upgrade later and pass your previous ones onto a friend that you’ve converted to the sport! I am looking for a walking pole that has a lock system to adjust and one that fits into my suitcasw which cannot be greater than 22.5 inches. Any recommendations? I am looking for a WALKING pole that that adjusts via clamps and fits into my suitcase – maximum length is 22.5 inches.